VATICAN CITY (Reuters) - Calls by a Roman Catholic archbishop and his conservative backers for Pope Francis to resign could make it difficult, if not impossible, for him to do so, Church experts say. 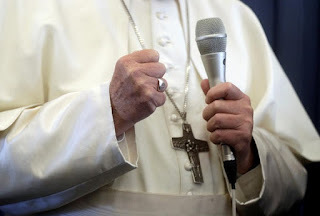 Canon (Church) Law says a pope can resign but the decision must be taken freely. In 2013, Francis’s predecessor, Benedict, became the first pontiff in six centuries to resign. I'm no fan of the church, and certainly they need to clean house, and yet, such as it is, they're so much more intelligent and kind than the Old Testament calvinist derivatives so involved in conservative politics. Like the Papacy is never, ever Political. True enough, but somehow, perhaps my lack of contact with catholic gatherings, they don't scare me. But I've seen first hand how a baptists preacher can whip a crowd into a frenzy that could lead to a lynching or more.